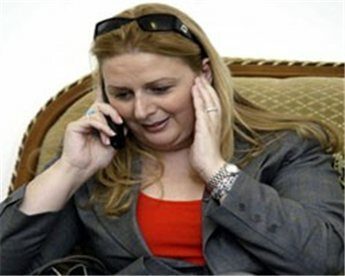 Suha Arafat, the widow of the late Palestinian president Yasser Arafat, says she wants to return to Palestine because life in the Diaspora has become unbearable. "I will be back to Palestine, to Ramallah. My life and my daughter's life in Diaspora has become intolerable. We lost security and safety as Abu Ammar left us. Every day since he passed I feel boredom and deadly sadness," Suha told the London-based newspaper Al-Hayat. Palestinians marked the fourth Anniversary of the death of their iconic leader on Tuesday. Arafat died of a mysterious medical condition in a Paris hospital in 2004. He spent his last days under besieged by the Israeli military in the presidential compound in Ramallah. Suha is currently living in Malta after moving there from Tunisia. "He used to care for every Palestinian family and take care of their small and large concerns ranging from the establishment of a Palestinian state to the simple daily life requirements. He also cared for his small family, me and my daughter, Zahwa. Look at what happened to our homeland and our cause and the political heritage. I miss him today and all Palestine misses him. All misfortunes can be simplified and forgotten, except death as its pain keeps deepening and increasing," Suha added. "When Abu Ammar [Arafat] was alive, he asked me and Zahwa to stay in Gaza and never leave after Israel bombarded our home. He refused our return to Ramallah because he considered himself a brave soldier who refused to use his wife and daughter as human shields for his protection. I have not felt homesick like I do today. I was sure about the dream of a Palestinian state and about Palestinian unity. Nowadays, I watch the news of unity and pray for the future of the Palestinian cause," Suha said. Thirteen-year-old Zahwa Arafat spoke briefly via telephone to Al-Hayat as she was heading to school, "I have exams, and it is tough stuff. I wish my father was alive, so he could have prayed for me to pass exams. I remember him as a leader and a struggler. I still remember how he used to telephone us every day asking me to focus on Arabic language and read the holy Quran. I went along with my mother to hajj [pilgrimage] in Saudi Arabia, and that could have thrilled my father." 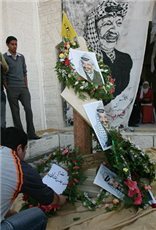 On Tuesday 11 November Palestinians commemorated the death of their first leader: Abu Ammar, Al-Ra'is (the president) and in the end Al-Khityar (the old man), former Palestinian President Yasser Arafat. At his best Arafat was a Palestinian hero and leader of the cause; he was a symbol of unity, pride and the power of the ideal. Arafat was a comfort for whoever had known him as much as he was a symbol of comfort for all his people. The man embodied much of what it meant to be Palestinian. Somehow, at the same time he was a refugee, he was a Jerusalemite, a Gazan, a West Banker and an exiled Palestinian who had felt deeply all of his torments. Al-Ra'is was a man that loved his people who died before he was able to achieve their dream. Arafat knew he was dying when doctors diagnosed him first with the flu and then with a terminal immune-deficiency disease, said political writer and analyst Yahya Rabah. "He never told anyone how he felt," said Rabah. Throughout his illness doctors piled him with advice which Arafat saw as a sort of lamentation, since he knew he was dying, Rabah, who was also a friend to Arafat, recalled. Despite his determined and often stoic appearance Arafat was open about his affection for friends and comrades Abu Iyad (chief of the Palestinian Intelligence Agency) and Abu Jihad (founder of Fatah and military leader). 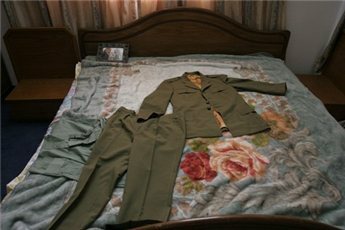 "When those two men were beside me I slept with comfort on my pillow, but since the day I lost them I felt explosives inside that pillow whenever I tried to sleep," he was said to have lamented. Arafat was a man with a sweet tooth; he drank only tea and not coffee, and rather enjoyed Nabulsi Kanafeh. Friends remember him slicing the sticky sweets with his hands and passing squares out to those around him. Arafat also loved the simple company of children. Some of his happiest times, recall friends, were drinking tea and playing with his daughter and the children of his close friends. He would watch Mickey Mouse cartoons with them and laugh from the bottom of his chest. He also enjoyed the higher arts, would listen to the reverberating songs of Umm Kalthoum, and enjoyed deep friendships with Arab poets, writers and actors like Adel Imam, Yousef Sha'ban and Madiha Yousri. On the day devoted to his memory, the celebration of his successes and the mourning of his failures, Palestinians gathered in groups to hear speeches, songs and stories bringing back into life the stories of the once great man. Two Palestinian students were injured on Tuesday when Israeli forces dispersed a commemorative ceremony in the villages south of Bethlehem city commemorating the fourth anniversary of the death of Yasser Arafat. . The ceremony saw hundreds holding photos of Arafat and signs attesting that the gatherers were committed to walking in his footsteps. The ceremonial procession walked up the main road near the Efrata settlement, where Israeli soldiers dispersed the group of mourners. Another commemoration ceremony in Tuqu south of Bethlehem also saw confrontations with Israeli forces, though no injuries were reported. Palestinian President Mahmoud Abbas' comments during a memorial ceremony for the late Palestinian President Yasser Arafat were slammed as an "attempt at incitement" by Hamas spokesperson Fawzi Barhoum on Tuesday. That afternoon Abbas had used the speech as a platform to call for unity, he condemned Hamas for "thwarting" both the Yemeni initiative and the Egyptian conciliation efforts and causing frustration to the Palestinian people, calling the actions "unacceptable." Barhoum called the speech one of a factional leader, not one of a Palestinian President. "He did not speak as a president of all Palestinians," Barhoum lamented, "but rather as a head of his party." He also criticized Abbas for failing to speak out in his speech against the new Israeli siege and blockade of the Gaza Strip, which will see the lights go out and the food supply stop if actions are not soon taken. Barhoum said the least Abbas should have done would have been to appeal to Egypt to open its borders and help alleviate the suffering. During his speech Abbas called on Palestinians to preserve and protect their accomplishments and move towards liberty and independence. 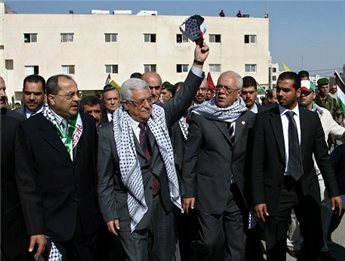 Unity and national agreement, he said, is the safety net for the Palestinians. Addressing Hamas accusations that he and the Fatah party had bowed down to the "Israeli-American veto" on Palestinian dialogue, Abbas said categorically that he does "not surrender to pressures." Throughout his speech Abbas reiterated the importance of a national unity government, which he said would be able to life the siege on Gaza and prepare the country for presidential and legislative elections. This is something that must be done "right now" he said, and not put off for tomorrow. "Those who are self-confident" he added, "must prove themselves at the ballot boxes." Fatah believes in democracy, he said, "even if we do not like the outcome." The democratic process is not like a match, to be used once and then discarded, Abbas explained, and insisted that Palestine would go to a referendum on the issue of elections "like all other democratic countries do." He insisted that Hamas was not interested in dialogue, citing what he said was a ban on Arafat celebrations across the Strip. He also noted that in previous years there had been injuries and even deaths at rallies commemorating the former Palestinian leader. Abbas finally called on Arab foreign ministers to pass judgment on who had thwarted the Palestinian conciliation talks, and made it clear that he would accept the judgment of the ministers regardless of what it would be.